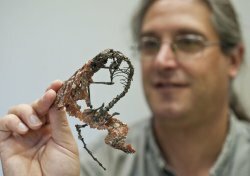 University of Florida researchers presenting new fossil evidence of an exceptionally well-preserved 55-million-year-old North American mammal have found it shares a common ancestor with rodents and primates, including humans. The study, appeared in the Oct. 11 online edition of the Zoological Journal of the Linnean Society, describes the cranial anatomy of the extinct mammal, Labidolemur kayi. High resolution CT scans of the specimens allowed researchers to study minute details in the skull, including bone structures smaller than one-tenth of a millimeter. Similarities in bone features with other mammals show L. kayi’s living relatives are rodents, rabbits, flying lemurs, tree shrews and primates. Researchers said the new information will aide future studies to better understand the origin of primates. Scientists have disputed the relationships of Apatemyidae, the family that includes L. kayi, for more than a century because of their unusual physical characteristics. With can opener-shaped upper front teeth and two unusually long fingers, apatemyids have been compared to a variety of animals, from opossums to woodpeckers. “There are only a few examples in the history of mammals where you get such an incredibly odd ecological adaptation,” Bloch said. Like a woodpecker’s method of feeding, L. kayi used percussive foraging, or tapping on trees, to locate insects. It stood less than a foot tall, was capable of jumping between trees and looked like a squirrel with a couple of really long fingers, similar to the aye-aye, a lemur native to Madagascar, Bloch said. Apatemyids have been preserved for tens of millions of years and are well known from Europe and North America. The skeletons analyzed in the publication were recovered from freshwater limestone in the Bighorn Basin by co-author Peter Houde of New Mexico State University. Located just east of Yellowstone National Park in Wyoming, the site is known as one of the best in the world for studying the evolution of mammals during the 10 million years following the extinction of the dinosaurs, Bloch said. Mary Silcox, first author of the study and a research associate at the Florida Museum, said scans of the specimens began about 10 years ago, during her postdoctoral work at The Pennsylvania State University. Doug Boyer of Stony Brook University is also a co-author of the study, part of the team’s larger research to understand the relationships of apatemyids to other mammals. Bloch and colleagues are currently writing a detailed analysis of L. kayi’s skeleton. John Wible, curator of mammals at the Carnegie Museum of Natural History and one of the researchers who reviewed the study, said it provides valuable information for understanding the evolutionary relationships of mammals.